Set between flower-strewn walls, mature woodland and the towers and crenellations of one of the most historic buildings in Sark, La Seigneurie Gardens provide a tranquil contrast to the windswept wildness of the island’s beautiful coast. The formal walled garden is one of the finest in the Channel Islands. The largely frost-free haven within its walls shelters many plants and shrubs that can only survive under glass in other parts of the British Isles. There are ponds and woodland to explore and fascinating artefacts revealing tantalising glimpses into the history of Sark. Colourful displays in the newly renovated chapel tell the history of Sark’s Seigneurs and the Seigneurie itself. (The chapel is also available for civil weddings and other celebrations.) The fruit and vegetable gardens will inspire those who grow their own produce and our new sensory garden aims to stimulate all five senses. Lose yourself in our maze, wander amongst our rose beds or simply soak up the peaceful atmosphere of these enchanting gardens. 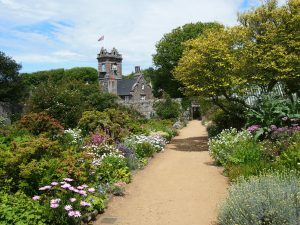 La Seigneurie Gardens are the highlight of any visit to the beautiful Channel Island of Sark. There are guided tours every Wednesday from March to the end of October at 11.30am with one of the gardeners costing £7. Call Sark Visitor Centre for bookings on 01481 832345. Guided tours for groups of 4 or more can also be arranged if booked in advance. The gardens are open every day from March to end of October from 10am to 6pm. Adults £5 and children under 14 are £1.50. During the summer season between May and September, local volunteers take visitors around the North, East, and West of Sark on tours of private gardens on the island. The walks normally take about two hours with refreshments in the last garden of the route. The walks start from the visitor centre at 2pm every Friday, and cost £5 per person which goes to a local charity. More details of these can be found on our online calendar.